Lazee Daizee 1/4" vs 1/2"
A 20 ga. wire is inserted into the 1/4" weave to allow the freeform design to hold it's shape. 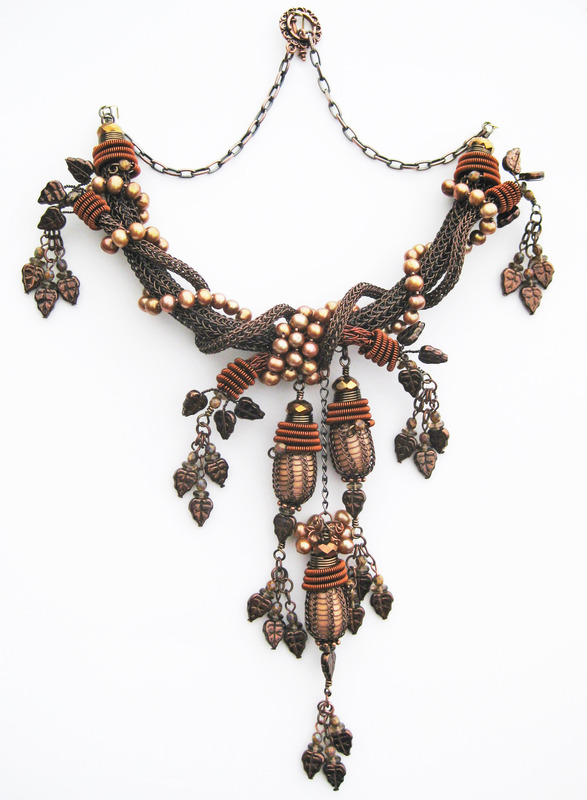 Wooden beads are inserted into the 1/2" weave for form acorns. End caps formed on the 1/2" tool top the acorns. Other than the obvious difference in diameter, which tool is best for me?A 6-loop Viking Knit chain on the 1/4" tool looks nothing like a 6-loop Viking Knit chain on the 1/2" tool. Both tools offer different design opportunities. The Lazee Daizee™ draw plate will accommodate both sizes of tools.The 1/4" diameter tool with a 6-loop head and size flat surfaces, generates a very flexible and fluid chain that works up fast and creates woven lengths that are great for draping as a necklace alone or with pendants. The largest diameter wire you can use with the 6 loop head is a 22 gauge, which will result in about a 3/8" diameter woven tube. This is a nice size for a bracelet, which will still remain flexible unless an inner support such as a wire or plastic tubing is used. Multiple stands and sizes can be used together to form a larger project. The 1/4" tool will also accommodate a 20 gauge wire by reducing the number of loops used and can be very effect as a bail when used over a smaller woven chain. The 1/4" tool is available separately for $24.95 or as an all-inclusive kit for $49.95, plus shipping. The larger tool is 1/2” in diameter with 12 loops and 12 sides on the surface. Due to the increased number of loops on the head you can be more creative and versatile with the number of loops used as well as accommodating larger gauges of wire more easily. It lends itself to decorative applications such as adding headpins with embellishments and, because of the larger diameter, items like pearls and gems can be inserted inside the weave. Weave on this tool can be reduced to 3/8” and 1/4” diameter, depending on the gauge of wire and number of loops used, however the weave is very stiff and does not drape well. The 1/2" tool is sold separately for $29.95 or in an all-inclusive kit for $54.95, plus shipping. Multiple stands of wire can be used with both tools.Creating different weave patterns, techniques, projects and more will be featured in “The Lazee Daizee™ Guide to Viking Knit” book. The book is based on the 1/4" tool but techniques apply to both size tools.